kc bob: Are Evangelicals are Playing the Faith Card? Has anyone seen Rick Perry's recent television advertisement where he speaks of President Obama's "war on religion". It is an interesting video where candidate Perry begins by saying "I'm not ashamed to admit that I'm a Christian". 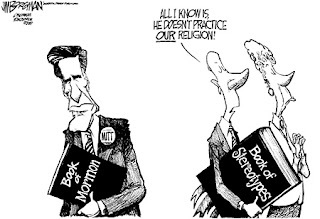 Reminded me of the evangelical pastor, and Rick Perry supporter, who told the press that Mitt Romney is not a Christian because Mormonism is a cult. Got me to thinking about the many conversations I have had about Jon Huntsman, another Mormon candidate, and how my evangelical friends avow that they could not vote for him because they believe him to be a moderate even though the evidence say that he is a conservative. A few years ago a blogging friend told me that they could not vote for a Mormon because they believed that all Mormons are deceived. I have come to believe that this is the case for a very large percentage of Evangelical Christians who will not vote for any Mormon regardless of how qualified or conservative the candidate is. Along with Rick Perry these voters are playing the faith card but refuse to admit that they are. I wish that they would. Politics and religion,in whatever country, should be avoided. It's just not healthy. Just my honest opinion.